Next time you visit us at Dockside Waterfront Grill, get in line before you arrive & check your Yelp Waitlist app for up to date wait times! Try it out by visiting our Yelp page here. For a couple of local boys, the allure of ‘Old Florida’ never loses its charm. And so it is for the Gecko’s Hospitality Group as Mike Quillen and Mike Gowan welcome the Dockside Waterfront Grill to their family of restaurants. Since 1950 when Venice pioneers Capt. Ben and Isa Mae Dunn broke ground on Fisherman’s Wharf Marina, the waterfront gem has endured as a local favorite in Venice. A destination with plenty of history, the waterfront restaurant also offers boat dockage, ample parking and exquisite views of Roberts and Dona Bays. Dockside Waterfront Grill’s open air dining under the tiki huts will soon be refreshed by Dockside’s authentic Florida seafood menu, some ‘family favorites’ from its siblings, a full plate of fresh, delicious fare and the top shelf hospitality that the Gecko’s Hospitality Group is known for. “Our Venice, Nokomis and Englewood friends have been encouraging us to make a home in the community, so when this opportunity arose we were delighted to be able to accept their welcome,” said Quillen. With Dollar & Double Dollar Discounts on your Favorite Premium Labels & Save a Buck on a selection of other Fine Spirits. 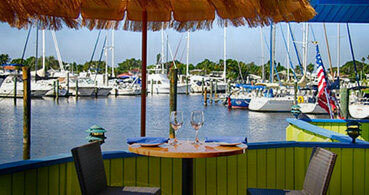 Want to join the team at Dockside Waterfront Grill? We strive to bring together caring, warm, fun, intelligent people who love to serve!